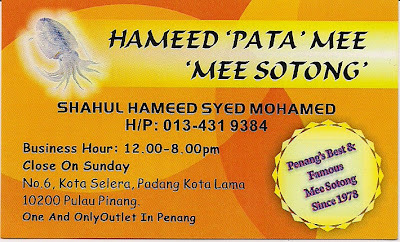 This Mee Goreng Stall is known as Hameed 'Pata' Mee or Mee Sotong to those who always patronize the stall but most of them call it 'Mee Sotong'. It is located inside the Kota Selara at Padang Kota Lama (Esplanade) beside the Fort Cornwallis and has been operating there since 1978. RM3.50 - RM5.00 per Plate. No. 02 : View of Kota Selara, Padang Kota Lama (Esplanade) from Leith Street, Penang. No. 03 : View of Kota Selara, Padang Kota Lama (Esplanade) from Leith Street, Penang. Squeeze the given lime. By adding the lime juice to the Mee Sotong, it enhence the taste. Note : Mind you it is very spicy and hot. Labels: Esplanade, Kota Selara, Mee Sotong, Penang.